If your business is thinking about installing commercial solar panels in Mesa, Alternative Energy, LLC can help! We are Arizona’s premier commercial solar contractors offering saving of up to 99% with solar and other energy products. Commercial solar alone can save you up to 75% off your currently electricity bill with the utility company. Small Business Owners In Mesa Can Pay Off Their Systems Fast! Solar power for small businesses in Mesa is becoming more and more popular as solar is getting cheaper to install. Small business owners pay an average commercial solar panel cost of $50,000 before tax credits. Mesa business owners can pay off their commercial solar systems in as little as 7 years of less. Plus, there are tax credits that can help you pay off nearly half the system in the first year alone. Not only can small business save with solar but medium to large business can save as well. The average business owner in Mesa is paying around $2,000 for their electricity bills every month. Installing commercial solar panels can bring your bill down a full 75%, reducing your electricity bill to $500/month. That’s a savings of around $1,500 a month. Alternative Energy, LLC offers Mesa business owners commercial solar panel installation with No Money Down, Low Monthly Payments and Many Commercial Solar Financing Options. Federal Tax Credit – The federal tax credit will save new commercial solar installers up to 30% of the total cost of your commercial solar panel installation. State Tax Credit – Arizona offers a 10% tax credit for business owners to help offset the cost of commercial solar panels. Accelerated Deprecation – Mesa business owners are allowed to deduct up to 85% of cost of their solar system from the taxes. This offers a big way to pay off the high cost of commercial solar panels. 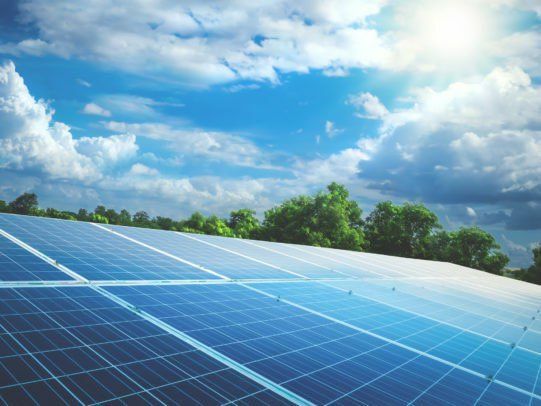 Alternative Energy, LLC is Arizona’s premier commercial solar panel installer and helps small businesses to large businesses in Mesa, Arizona go solar. Save up to 99% on electricity with commercial solar panels and other commercial energy saving products. Get a free commercial solar quote!